I have been remiss in my blogging - it's been a while. But now it's truly summer, the flowers are blooming like crazy, the baby birds are showing up at the feeders, and we're enjoying fish on the grill several times a week. 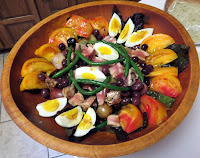 Two of my favorite summer meals are grilled salmon with one of Jaime's fresh pestos -- he can turn almost anything green into the most incredible pesto -- and Salad Nicoise, a beautiful bowl of goodness that's great for entertaining. 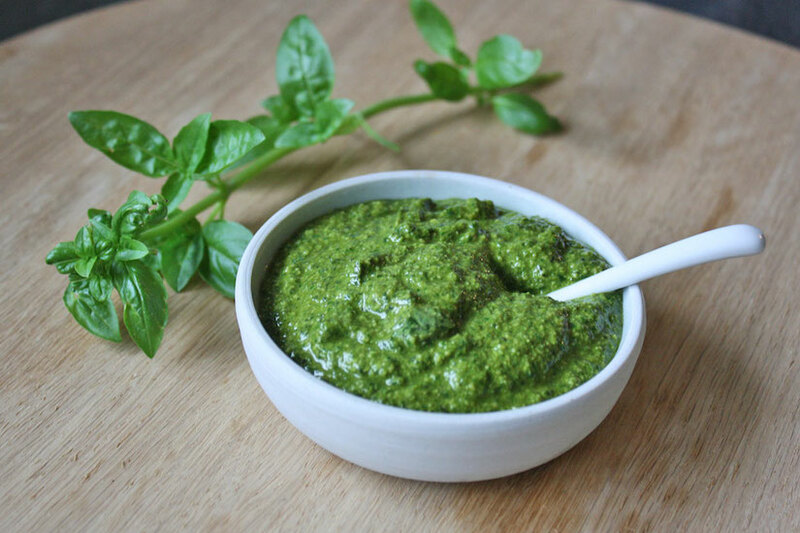 Green Pesto, Arugula Pesto, Cilantro Pesto, and Poblano Pesto, all the main ingredients supplied by our local farmer's market. With a food processor, you could easily make these at home, but if you're close to our Hinsdale store, just come and buy Jaime's. Both the mustard greens and arugula add a touch of spiciness to your meal - grill your fish for 8 or 9 minutes (depending on thickness, maybe less, maybe more) and add the pesto to the top of the fish for the last minute of cooking. You don't want to cook the pesto, you're just warming it up. Too much cooking and it will lose it's flavor. Salad Nicoise is a French potato salad topped with tuna, green beans, hard boiled eggs, fresh tomato wedges and Nicoise olives. Great for summer entertaining, you can make the entire meal ahead and just assemble it while your guests enjoy wine and hors d'oeuvres on the patio. This is an easy French-inspired summertime meal that has something for everyone, and uses loads of fresh market ingredients. For the dressing: Whisk the vinegar, mustard, and a large pinch each of salt and pepper in a medium, glass or non-metalic bowl until combined. Whisk in the olive oil in a slow, steady stream. Stir in the herbs, taste, and season with more salt and pepper as needed; set aside. Sear and bake or lightly grill the fresh ahi or albacore tuna so that it is still a little pink on the inside. A 1” thick piece of tuna will require 1 minute of searing each side, then another 3-4 minutes in a 425° oven. Set aside. (Fish will continue cooking, so err to the rare). Place the potatoes in a medium saucepan. Add enough water to cover by 2 inches; bring to a boil over high heat. Reduce the heat to medium and gently boil until the potatoes are easily pierced with a knife, about 10 minutes. Using a slotted spoon, transfer the potatoes to a cutting board until cool enough to handle but still warm. (Do not let the potatoes cool completely.) Meanwhile, return the water to a boil over high heat. Add a little salt, then add the green beans and blanch until tender but still crisp, about 1 to 2 minutes. Drain and rinse under cold running water until cool. Spread the beans on paper towels and let them sit until dry. When the potatoes are ready, slice them in half. Place in a small bowl and toss with just enough of the dressing to lightly coat. tuna and green beans over the potatoes. Top with the anchovy fillets, egg quarters and olives. Serve immediately and, if you choose, with remaining dressing on the side. Add a chilled bottle of Pouilly Fume and some crusty bread and you have a meal fit for a Roi! NB: If you're making this for a party, keep all of the various dressed parts of the salad in the fridge until you're ready to serve, then simply put it all together. I actually drop the beans in the same pot with the eggs - saves water. Come and see Jaime grilling on Saturdays, and have a taste of his many wonderful salsas and pestos - he'll be in front of the store from 11-2 most Saturdays, weather permitting. Learn from the best!